Normally I talk about my Italian and Greek heritage here, well, because that’s what I am. But then, there’s my Cuban family. Isabel’s family is great – they’re warm and welcoming, and they can cook their asses off. I love getting together with them not just for the company, but because I know I’ll be very well fed 🙂 A few years ago, Isabel’s dad, Domingo, gave me his chimichurri recipe, and I’ve made it a handful of times since then. Yes, I know it’s Argentinian, but whatever. It ROCKS! It’s the perfect recipe to add to your arsenal now that grilling season is here. It freezes well too, so make this in big batches to make life easier. The measurements are approximate so it’s important to taste as you go. Place parsley, garlic, cilantro and mint in a glass jar (make sure it has a tight lid – and do not use plastic). Add oil, lemon juice and vinegars until the herbs are covered…then add salt, pepper and paprika. Test and correct to taste, adding more vinegar, salt and pepper, if deemed necessary. Cover and refrigerate. For best flavor results, refrigerate for a day or two before using. This entry was posted in condiments, freezer friendly, grilling, sauce. Bookmark the permalink. I just tried chimichurri a few months ago and thought it was just amazing. My brother had made it for a dinner he grilled and there was a bunch leftover. He asked if I wanted it and I snatched it out of his hands. It was so good! I’m excited to make some of my own. This recipe looks delicious. Wow, you’re a lucky girl. You seem to have a lot of wonderful people in your life–and they can cook! Yes, it was warm just south of us today! Hmm you’re making me think I need to get my brother to marry someone from an ethnic background whose food I truly adore. On it. 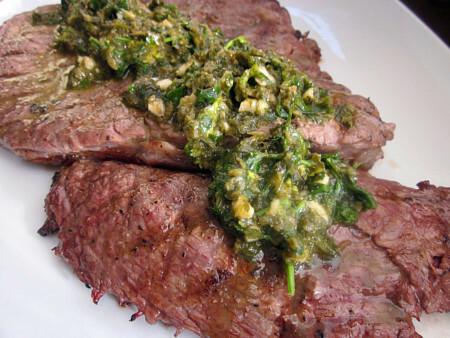 What a delicious chimichurri! I find it to be such a refreshing condiment!